Rent Galerie Myrtis | Corporate Events | Wedding Locations, Event Spaces and Party Venues. Conveniently located in on Charles Street in Baltimore, Maryland, Galerie Myrtis is available for art/education events and programs. 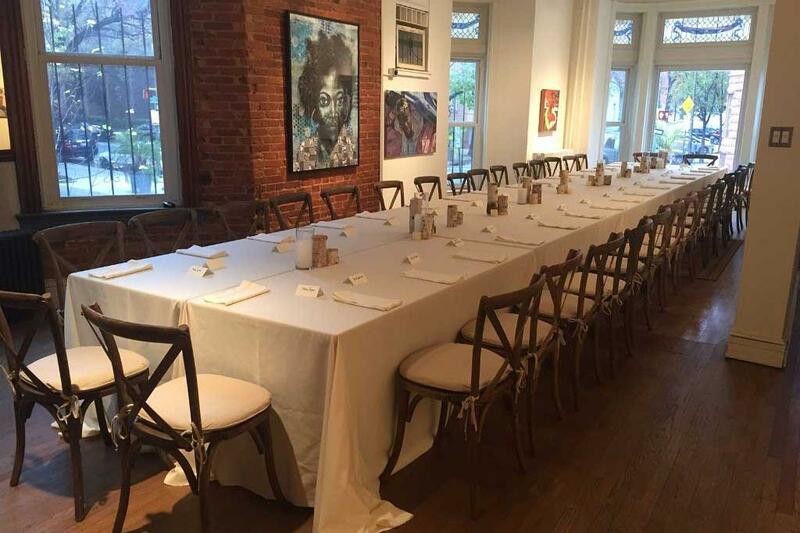 No matter what type of event you’re planning, Galerie Myrtis will work with you to ensure your event is a success! Founded in 2006, Galerie Myrtis is a contemporary fine art gallery which represents emerging to mid-career artists who have achieved regional, national and international acclaim. The gallery was originally located on Capitol Hill in Washington DC. The mission of the gallery is to utilize the visual arts to raise awareness for artists who deserve recognition for their contributions in artistically portraying our historic and cultural landscapes; and to recognize art movements that paved the way for freedom of artistic expression. Galerie Myrtis presents approximately 6 exhibitions per year in which each artist’s creative voice is expressed through paintings, photography, sculptures and new media art with a tendency towards conceptual as well as politically and socially engaged artwork. The gallery also hosts artist’s talks, “Tea with Myrtis” a series of art salons, and artist workshops and lectures.